Using Landfill and Incineration for America’s Waste Leaves the Nation at Risk of Leaks from Landfills, and Air Pollution from Incineration. – But No Such Risks Exist from Anaerobic Digestion! Due to the rapid pace of US of population growth and economic development, solutions for sustainable energy and reaping the full benefits of all the sun’s energy in all types of organic waste desperately required. The U.S. alone generates over 250 million tons of municipal solid waste annually two-thirds of which is putrescible organic waste. It’s truly massive! It all has to be got rid of! Nevertheless, most of this important energy resource is straight away disposed through landfill and incineration. This results in massive ecological damages will be brought upon future generations when the landfill liners all decay and leak. Nearly none of the waste created in the United States is handled by environmentally-friendly anaerobic bio-degradation innovation, normally because the historic degradation method of anaerobic digestion innovation is said to be too expensive, and inadequately proven as a technology worth investment. But, many of those that have taken the plunge into the unknown, innovated and made the investment, have revealed this to be incorrect, particularly in Europe. The US now lags behind lots of other nations in this regard. Nevertheless, those that have started and have actually executed this innovation, as a technique of waste treatment, are reporting economic success. Amazingly, these “early adopters” have discovered a whole bundle of synergistic secondary benefits from owning a biogas digester. The result is that they are gaining more from the process, than they expected. These benefits are all to do with energy and farm sustainability, a decrease of pollution risk to watercourses in the locality of their farm, and the potential for enhancement of the soil quality in their fields. The United States have many departments from energy to agriculture which need to understand this before joined up government support can start. But, the good news is that the US government is at last awakening to the many benefits of the age-old anaerobic fermentation process. This is a procedure which can be widely adopted for quick creation of renewable biogas which a clean burning fuel, and the other main product is a great plant feed and is easily sanitized using the plant’s own heat energy. As energy rates, populations, and levels of environmental pollution continue to rise worldwide, the nation is in desperate and immediate need of sustainable bio-energy collection and waste treatment/ disposal technology. But we think it is remarkable news that in 2015, despite falling oil prices, the US has actually begun to value this waste to energy and renewable energy. 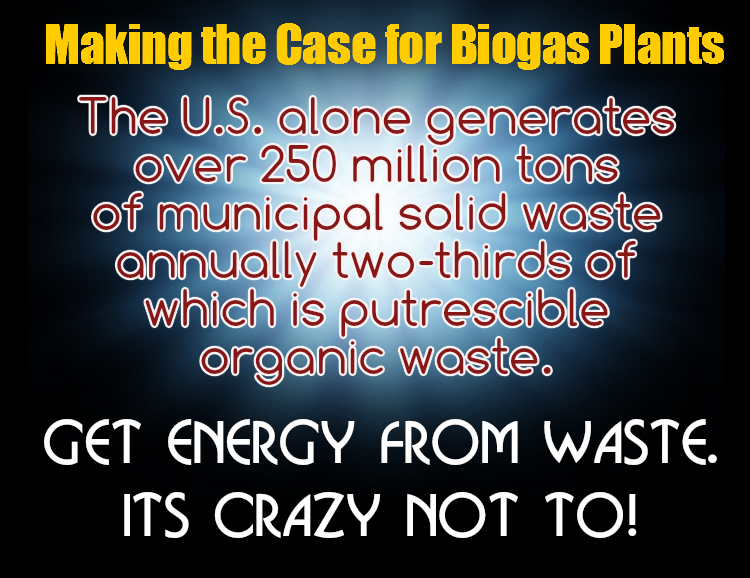 More biogas plant tasks than ever are expected to be started during 2015, that’s being promoted by United States government initiatives in partnership with a wide panorama of company types. What is Wrong About Current United States Waste Management Practise? About a fifth of United States waste is incinerated. However, this is no longer a defensible option. Incineration is falsely represented as an effective approach of organic waste reduction. while it is certainly capable of that, the point is that there are much better ways to treat waste in which the percentage of weight reduction becomes immaterial, as soon as the output become a useful product. From a general point of view, it supplies little or no advantage to the whole biosphere that an incinerator changes the form of wastes into a variety of hazardous particulates, gases, and grate ashes. The highly hazardous dioxins are bad enough but the emitted carbon dioxide can trigger acid rain. Acid rain is proven to damage plants, wildlife ecologies, watercourses, and the ground below our feet, and eats away at many of our buildings. The left-over damaging ashes from the incinerator are buried in a landfill. The result is to worsen lots of forms of water pollution which are already often present. Primary and secondary costs of the incineration are both additive and high. Energy and resources are also significantly consumed during incineration construction and operations . In 2009 52 % of all US strong waste went to fill land fill sites. Garbage dumps have actually been shown to leakage more time than not, in spite of much work being done to avoid unwanted gets away of polluting emissions from land fill. The whole concept of landfilling must be relegated to history. Neither garbage dump, nor incineration is a sustainable biomass waste management method that huge ecological damages have actually been inflicted on air, soil, and water quality by following present waste management policies currently. Some state that aerobic composting is the best option for organic wastes. On the contrary, aerobic composting is not truly an environment-friendly approach to manage the waste. It does do well by reducing ecological effects, and it does likewise provide organic fertilizer for better agricultural performance. An issue which needs to be stressed is that aerobic composting consumes a great deal of energy. It has to be handled on-site numerous times, turned and ventilation is usually necessary making use of recirculating pumps to make air pass through and maintain aerobic conditions. Anaerobic digestion does this without much energy use and what is needed can be supplied by its own biogas energy output, and yet over and above that and heating for the digester tanks, it also delivers a net output of fuel as yet more biogas (which is composed 50 % plus of methane). Also, let’s not forget that the anaerobic digestion process will save garbage dump volumetric capacity, and tends to push down disposal cost. It is likewise an inevitable producer of fertilizers due to the nature of the reaction which takes place in a biogas reactor. In fact, anaerobic decomposition by micro-organisms in without oxygen present is an eco-friendly technique long-known to break-down the biomass waste, and produce trace nutrient rich organic fertilizers, which easily win in comparison with aerobic composting for their sustainability. The energy output (product) is biogas,. This can be used for both heat (CHP) and power. Biomass-waste anaerobic digestion as an innovation for improving waste management is likely to be the the most promising chance available for improving waste disposal sustainability for the next decade. The belief is that a range of advantages can be achieved through the development and operation of thousands of new (additional) biogas plants. Why If You Were Somewhere Undeveloped Would Off-Grid Biogas be a Big Deal?